The Maldives signed articles of agreement today to establish the China-led Asian Infrastructure Investment Bank (AIIB) as one of 57 prospective founding members. Finance minister Abdulla Jihad signed the agreement at a ceremony held this morning at the Great Hall of the People in Beijing. The AIIB was created in October to fund Asian energy, transport and infrastructure projects and rival the Western-dominated World Bank and Asian Development Bank. Arif Hilmy, an advisor to the finance minister, will reportedly represent the Maldives on the bank’s board. 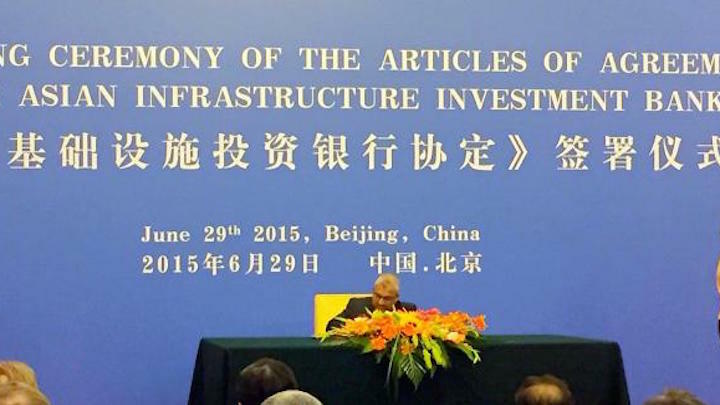 The AIIB will be will be an important global financial institution. Thank you Pres. Yameen for efforts to make Maldives a founding member. Representatives from 50 of the 57 founding members also signed articles of agreement today, which determines each members’ share and contribution to capital. The UK, France, Germany, Norway, Russia, Australia, South Korea, Singapore, Saudi Arabia, India, Indonesia, and Brazil are among AIIB founding members, but Japan and the US are opposed to the bank. The US had questioned standards at the new institution and tried to dissuade allies from joining. The bank is due to begin operations later this year with a capital of US$100 billion. With 30.4 percent, China is the largest shareholder, followed by India (15 percent) and Russia (6.5 percent). China also has effective veto power over the bank’s decisions with its more than 25 percent voting share. During a recent visit to China, President Abdulla Yameen said Sino-Maldives bilateral relations are at an “all-time high” with the establishment of a cooperative partnership between the countries last year. Sin-Maldives bilateral relations are at an “all-time high” with the establishment of a cooperative partnership between the countries last year, President Abdulla Yameen has said. President Xi Jinping in his historic state visit in September invited the Maldives to “journey with China on the high-speed bullet train to progress and prosperity,” President Yameen said in his keynote address at the opening ceremony of the 10th China-South Asia Business Forum yesterday. “This was an invitation that my people accepted wholeheartedly. We needed no second invitation,” he said. Yameen said China’s role in the Maldives’ economic development is “unmistakable” with Chinese visitors accounting for a third of annual tourism arrivals. “It is also among the highest value and fastest growing markets, with a staggering 92 percent of visitors coming to our serene shores for the first time,” he added. The Maldives has also become one of the first partners in the Chinese ‘Maritime Silk Route’ initiative and a founding member of the new Asian Infrastructure Investment Bank (AIIB), Yameen continued. “I have always believed that economics and not politics present us with the pragmatic solutions needed to overcome our current development challenges,” he said. Yameen said he was elected with a “clear mandate to transform the country’s economic fortunes” by creating jobs for youth, restoring macroeconomic stability, and inspiring investor confidence. China has meanwhile presented to the Maldives and other South Asian countries a “golden opportunity of infrastructure development” through the Silk Road initiative, the AIIB, and joint economic commissions, he said. The 21st century is the “Century of Asia,” Yameen said, and no Asian country showcases the industry and potential of Asians more than China. “Transcending from the outdated geopolitics of suspicion and imperialism, China has presented to the world a clear vision of ‘win-win’ cooperation, based on trust, sincerity and support,” he suggested. Many of the government’s planned ‘mega projects’ are benefiting from Chinese support and assistance, Yameen said, adding that civil works on the construction of a bridge connecting Malé and its suburb Hulhumalé – to be called the “China-Maldives Friendship Bridge” – will begin at the end of the year. During his ongoing visit, President Yameen met Chinese Vice President Li Yuanchao on Thursday and signed an agreement on carrying out the feasibility survey for the bridge project with Chinese grant aid. “The outlook is bright for the Maldives. Investor confidence in the country is today at an unprecedented and previously unattained level,” he said. “Furthermore, the ongoing dialogue to establish a Free Trade Area with China and expanding the trade benefits that we enjoy with India through the SAFTA mechanism of SAARC will further enhance the investment potential of the Maldives, especially in the trading and shipping sectors,” he said. An agreement was penned today during President Abdulla Yameen’s visit to China for carrying out the ongoing feasibility survey of the Malé-Hulhulé bridge project with Chinese grant aid. 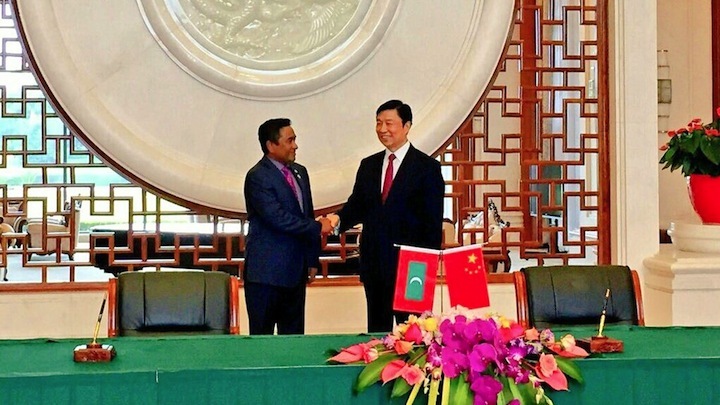 The “agreement on the economic and technical cooperation of grant” was signed after a meeting between President Yameen and Chinese vice president Li Yuanchao, according to the president’s office. 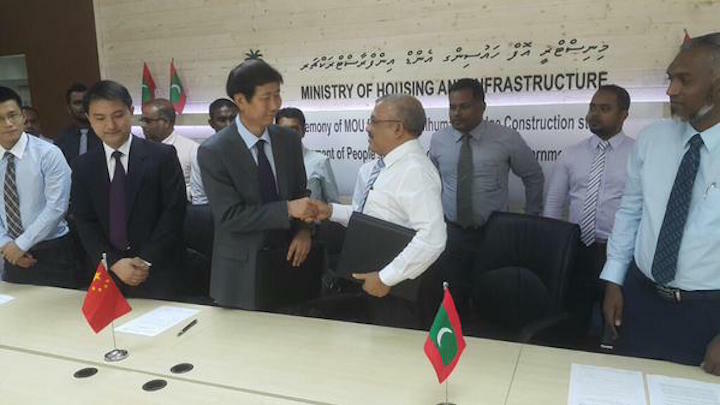 Speaking to reporters prior to departing to China last night, president’s office minister Mohamed Hussain Shareef said “a large portion” of the bridge project will be financed through Chinese free aid and the rest through concessional and commercial loans. Along with the feasibility report, Shareef said the Chinese government will present options for building the bridge as well as the estimated cost for each option. The government has previously said the project will cost between US$100 million and US$150 million. China has previously said it would ‘favorably consider financing’ the bridge if the design proves feasible. The economic council has said the six-mile bridge will have six lanes and will span from Malé’s eastern edge to the western corner of Hulhule, where the airport is located. Last month, a team of Chinese technicians began drilling bore holes on the ocean floor to gather information for the feasibility survey. Shareef said last night that in his meeting with the Chinese vice president, President Yameen will discuss financing for the bridge project, projects in the Maldives under the Chinese maritime ‘Silk Route’ initiative and expediting a US$40 million loan from the Chinese EXIM bank for developing the international airport. The government has previously said a total of US$600million is needed for the project. Although the economic council first said they will borrow the funds from China and Japan, the fisheries minister in March said Saudi Arabia had assured loan assistance at a low interest rate for airport development. Shareef is accompanying President Yameen during his visit to China along with economic development minister Mohamed Saeed and representatives from Maldivian businesses. The president departed on Wednesday morning to attend the 3rd China-South Asia Exposition, and the 23rd Kunming Import and Export Commodities Fair. The president is due to deliver a keynote address at the joint opening of the fairs. The fairs will take place from June 12-16. According to state broadcaster Television Maldives, a symposium was held at the Grand Park Hotel in Kunming today to share information with Chinese investors. More than 80 companies from the Yunnan province participated in the ‘Invest Maldives Symposium,’ said economic development minister Saeed. An ‘Invest Maldives’ page was launched on Chinese social media network Weibo during the symposium as part of “promotional efforts” for an investment forum to be held in Beijing, Saeed said. Businesses in the Yunnan province expressed interest in carrying out renewable energy projects in the Maldives, he added. Shareef meanwhile said the Chinese government will cover almost all of the expenses for organising the investment forum in October. While sponsors funded the first investment forum held in Singapore last year, Shareef said the government covered some costs. Following an official state visit to China in August last year, President Yameen said the likelihood of the bridge project being awarded to a Chinese company was “99 percent” and that “a large portion” of the project would be financed through free or concessional aid from China. In a historic visit the following month, Chinese President Xi Jinpeng said he hoped the government would call the bridge “the China-Maldives friendship bridge”. President Abdulla Yameen departed for China this morning to attend the 3rd China-South Asia Exposition, and the 23rd Kunming Import and Export Commodities Fair. 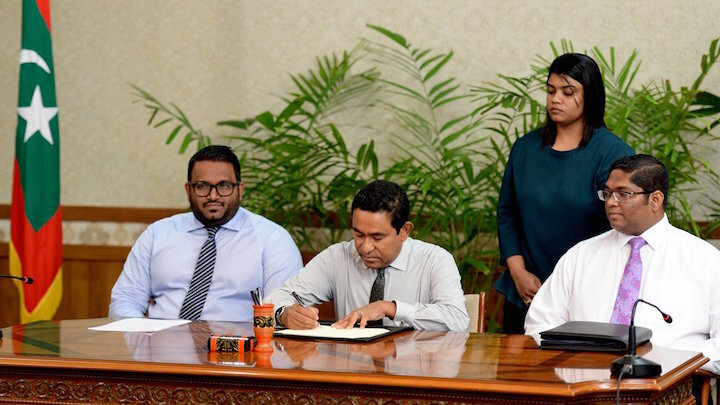 The president was accompanied by president’s office minister Mohamed Hussain Shareef, economic development minister Mohamed Saeed, and “numerous company heads representing the Maldivian business community”, according to the president’s office. Local media reported earlier this week that the president is scheduled to give a keynote speech at the joint opening of the events. Leaders of the eight SAARC countries and Saudi Arabia will attend the fairs. President Yameen made an official state visit to China in August last year while Chinese President Xi Jinpeng’s official visit the following month marked the first time a Chinese president visited the Maldives. 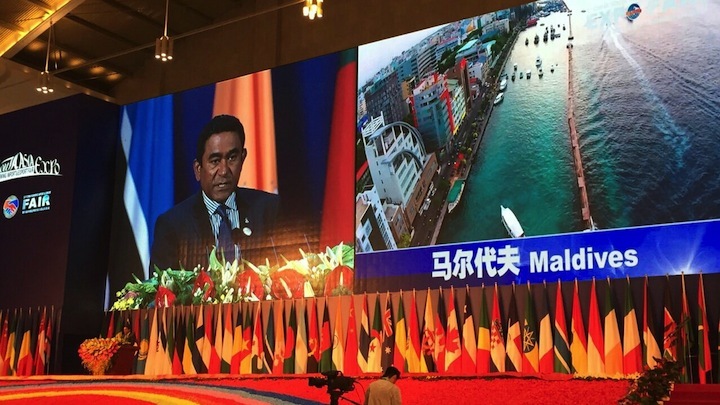 The Maldives is meanwhile planning to hold an investment forum in China’s capital Beijing in September. “Beijing will be a perfect place for Maldivian businesses to promote their businesses and networking,” minister Mohamed Saeed said in a tweet. 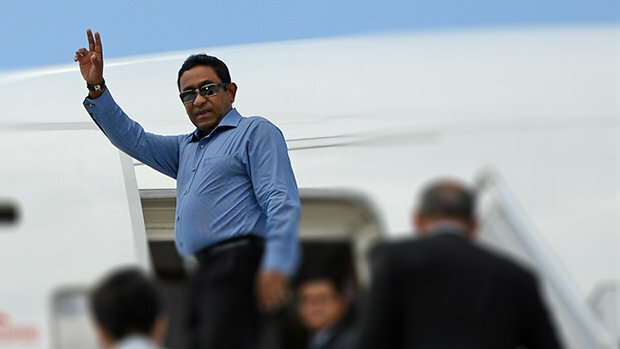 President Yameen’s departure comes ahead of a third mass protest planned by the opposition for June 12 over the imprisonment of former President Mohamed Nasheed and other opposition politicians.